Anne Fink, President, Global Foodservice, was interviewed by Bloomberg about PepsiCo’s expansion with bubly Fountain and Vending. The full article can be viewed here. Water continues to be a clear winner today. According to Beverage Marketing, in 2016 bottled water overtook soda as the #1 beverage sold in the U.S. And, as overall demand continues to grow, consumers also continue to look for more specialized and personalized hydration options, especially when they are on-the-go.Consumers make more than 200 visits to foodservice establishments each year; they visit a foodservice location even more frequently than they visit the grocery store. To meet this demand, PepsiCo is developing a broad spectrum of water and hydration solutions designed to meet the growing consumer demand for flavored and sparkling water across multiple channels. In the first half of 2018, they successfully launched several innovations within the hydration space in the U.S., including bubly, a test of Aquafina Water Station and Drinkfinity. Building upon initial success, each of these brands and platforms will continue to go beyond the bottle and expand through new channels to meet the continual growing consumer demand for flavored and sparkling water. 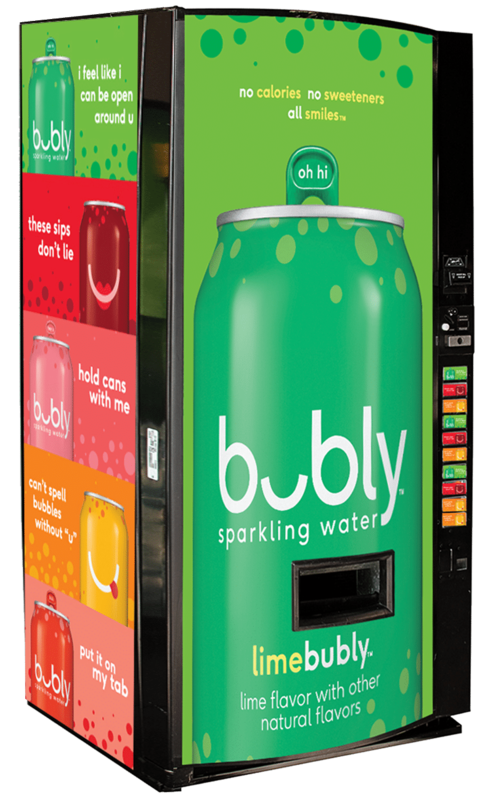 Tapping into the growing market for sparkling water and delivering on the variety consumers are seeking, PepsiCo Foodservice bubly is the first brand to offer a 100 percent sparkling water vending solution at scale with 150 high school campuses across the country currently operating bubly branded vending machines that dispense only 12 oz. cans of bubly. This provides students with the variety they are used to from this category even when they’re not at home. Students love the fun graphics and are excited to have another option outside of plain water available to them while they are at school. Lime is the most popular flavor, which is consistent with what PepsiCo is seeing in retail.